I knew it would happen eventually, I would get my first “fan” mail. I perhaps was misguided and thought that the first experience would be more positive. And I know the common wisdom to not engage the internet trolls, but this time the troll landed in my Inbox—it wasn't just a random review up on GoodReads or Amazon. I would never respond to those. But when you e-mail me something racist, homophobic, or just plain bigoted, you might find me punching back. 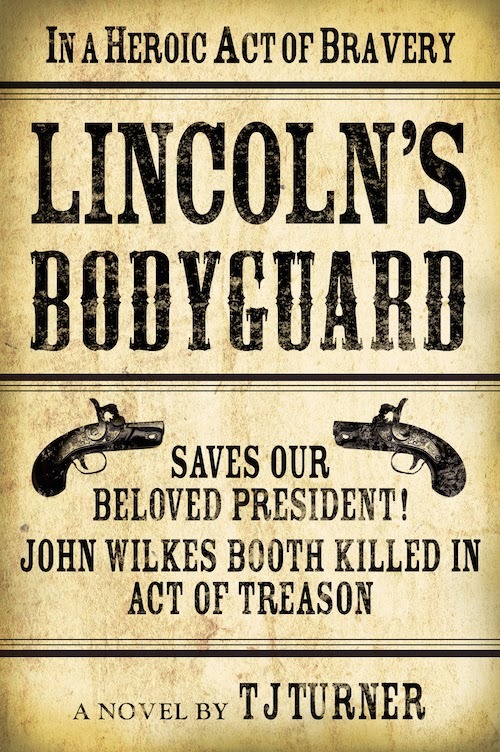 Besides, after spending three years working, revising, polishing, and now showing-off Molly and Joseph's story, I feel somehow compelled to rescue that copy of LINCOLN'S BODYGUARD! SPOILER ALERT: For those of you yet to read the novel, the e-mail to me (and to a lesser extent, my return e-mail) do give up a few plot points. While they are not minor points, if you've read about the first 30 pages, you already know them! And in fact, Amazon lets folks read an excerpt that talks about most of them anyway. There are plenty of other plot twists to be had, so your enjoyment of the novel should not be ruined should you choose to proceed. You've been warned though! Below is the e-mail I've received. I have masked the e-mail address to protect the guilty. I finished reading your book. I have never written to an author before but I must speak against how you insulted our President. I understood your book was a new history of the civil war, but I hoped for more accuracy. It appalled me early in your book that President Lincoln had an affair, and with a black woman. No president back then would lower their standards, maybe today but we live in different times. You forget your history or never read it. Some call President Lincoln the liberator of slaves, but they don't know he would have shipped them all back to Africa to be with their people. America would have no racial problems if he lived. I almost stopped reading sooner. It also offended me with how you write about the underground railroad. That was a system where white people freed the slaves. You insult those people saying black people would help white children. They would laugh and enjoy little white kids forced to work in factories not help them. Also your character Molly is completely not real. Women in the civil war knew their place and would not carry a gun or get into fights with men. Hollywood makes us think that but its just not truth. When she saves Joeseph it just shows he is not a good hero for a book if he cannot fight his own fights and win. I would write a review for amazon but they only let me give you as low as one star. This deserves none. I will not deal with it anymore since it already wasted my life. Your letter is the first piece of “fan” mail I have received. So it is nice to know that at least my e-mail server is working fine. I am working under the assumption that both your name and e-mail address are fake, as I well know who Forrest Carter was. I do have to thank you for writing your thoughts so clearly as to leave no ambiguity in your intentions. A greater man than either you or I, (especially you) gave us the only manner by which to judge another person—by the content of their character. Your letter leaves no doubt in that regard. I would apologize for the fact that you did not like my novel, but in truth, offending a person such as yourself actually brings me great joy. Although you claim me to be devoid of historical fact in my work, especially in my description of a liaison between President Lincoln and a former slave, it is immediately clear that you are not the student of history you believe yourself to be. While it is true that early in Lincoln's first term he supported the Colonization movement—sending free African-Americans back to Africa—his opinions on slavery and the outcomes for freed slaves changed immensely. He championed the 13th amendment to the Constitution explicitly banning slavery, and even spoke of Black Suffrage (that's voting) by the end of his time in office. He moved to instate equal pay for black soldiers. As for his “affair”. Perhaps you have heard of Thomas Jefferson? He was the man Lincoln most admired and looked up to, and it may surprise you to know (although it would not surprise anyone who knows American history), that no less a man than Jefferson had a years-long relationship with a woman named Sally Hemings. Together they had 6 children. The catch—Hemings was one of Jefferson's slaves! So much for your theory of the lowering standards amongst the presidential circle. I won't even address your Underground Railroad affront, other than to say that in my opinion, if my alternative history had played out, newly freed slaves would be exactly the type of people against a defacto slavery forced on children—even white children of their former slave owners. They knew the bonds of oppression better than any other, and would have fought against it in any manner they could. And then there's Molly...she is a smart, tough, and beautiful woman, more than capable of handling herself in the post-Civil War time period of my novel or any other time. Did women like that exist? HELL yes. And they still do. Go read any book about the frontier. Too bad you haven't encountered one as she would most definitely have enlightened your viewpoint. I'll make you a deal. As you are my first “fan” mail, I'll give you an offer you can't refuse. I will completely refund your purchase, as well as any shipping and handling costs you incurred. I will do this on two conditions. 1. You ship me back my book. I'll find an intermediary place for you to ship it where I can recover the novel. I hate to think of it in the hands of someone with such an ignorant perspective on life. It would give me great pleasure to see it returned to loving hands. 2. Post a review on Amazon for me—immediately! I know you can't make it the zero-stars you think it deserves, but trust me, a 1-star hurts both an author's pride as well as his/her overall rating. I would suggest you just take your e-mail and cut and paste it right in, that way you waste no more of your life on me or my novel. While you're at it, perhaps you missed the fact that Joseph is half Native American. I'm sure you could enhance your review by denigrating yet another demographic. I will treasure that rating, even more than the slew of 4-star and 5-star ratings I have received. In fact, I will print it out and frame it for my office. It will be my badge of honor. Please send me your address—we'll just make it the full list price and say $10 should cover shipping. I will be sure to get it in the mail at the very next opportunity. At first the arrival of this e-mail pissed me off. But then I thought that maybe there's a silver lining. Obviously FC made it though most of the novel, if not all. And as misguided as his viewpoint is, it made him feel something. (I'm quite pleased with myself that it pissed him off!) Ultimately that is the goal of any novelist—to highlight the human condition, and make your readers feel. If you're really good, the writing can challenge their beliefs, though I think my new “friend” above is a lost cause. So ultimately this e-mail made me think about my novel in a different way. When I sat down to write LINCOLN'S BODYGUARD, I did not explicitly intend to write a story about race in America. I knew from the historical setting that race would be a factor—a large factor. But the intent was not to highlight some truth about the time period, or to relate it back to today's challenges surrounding race. Perhaps that's because as a white male I often don't feel like I have the perspective to say anything profound that will help us understand or alter the societal behavior underlying our racial tensions. Of course, it's hard to write anything set in the 1860-1870s without dealing with race in some manner. So while I set out to write a compelling story that would capture the imagination, and at times turn history on its head—such as with the role reversal of the Underground Railroad—I hadn't thought of the novel as significantly highlighting the issue, as there are far greater writers than me peering into our nations lurid past (and even present) racial history. But maybe what this example highlights is the fact that when you release a piece of work—particularly a piece of artwork like writing or poetry, songs, or maybe even paintings—the consumer is free to interpret the meaning in their own context. It no longer belongs solely to the artist, but to the person enjoying (or not enjoying!) the work. Maybe it’s fitting that some of the themes in LINCOLN'S BODYGUARD resonate with today's world. I've heard it said that all great works of historical fiction tell us as much, if not more, about our own time then the time period they are set in. Maybe what we learn from this today, what “FC” shows us, is that we still have a long way to go in order to fulfill the dream that is America—a land where everyone has an equal opportunity to succeed. TJ Turner is the author of LINCOLN'S BODYGUARD, an alternative history that rights one of the nation’s greatest wrongs—the death of President Abraham Lincoln. Told from the perspective of the bodyguard who saves Lincoln, it presents an alternative dystopian view of the nation that would be, and one man’s attempt to find redemption while saving the nation. Wow, TJ if I'd have known that I would have written first. I LOVED the novel and I used a review as my "fan mail" to tell the world. I do not think you insulted our President, you showed a very human, very caring, very conflicted man who in my opinion practiced the racial unbiased lessons that he taught. Also one thing that PC (who is very un PC) forgot was that this book is FICTION!! And very good fiction if I might be so bold as to say. Actually, Debbie...you really were first, you just hit me up through Facebook. So thanks for reminding me! I'll consider yours my first message! And thanks for the kind words! Way to counter-attack with a blistering response! Thanks! I know, should never feed the trolls, but on this one I couldn't let it go unanswered!